One of my favourite breakfasts is tomatoes on toast with balsamic syrup at Astoria in Lambton Quay. (It’s even better since they have been offering ‘trim’ coffee.) I asked them once how they made the syrup and was told it was very difficult and included about 20 different ingredients. As a consequence I have been buying it from various outlets around town. But not any more. When it came time to make the dressing for a salad at the weekend, guest chef Mitch sprang into action. He mixed 1 part balsamic vinegar to 1.25 brown sugar and reduced over the heat. We drizzled it over the salad – it was deliciously intense and went well with Moon over Martinborough Olive oil. It made a decent sized jar full of syrup which will keep for ages in the fridge. I used it again last night on what started out as a beetroot and mint salad but developed into much more. 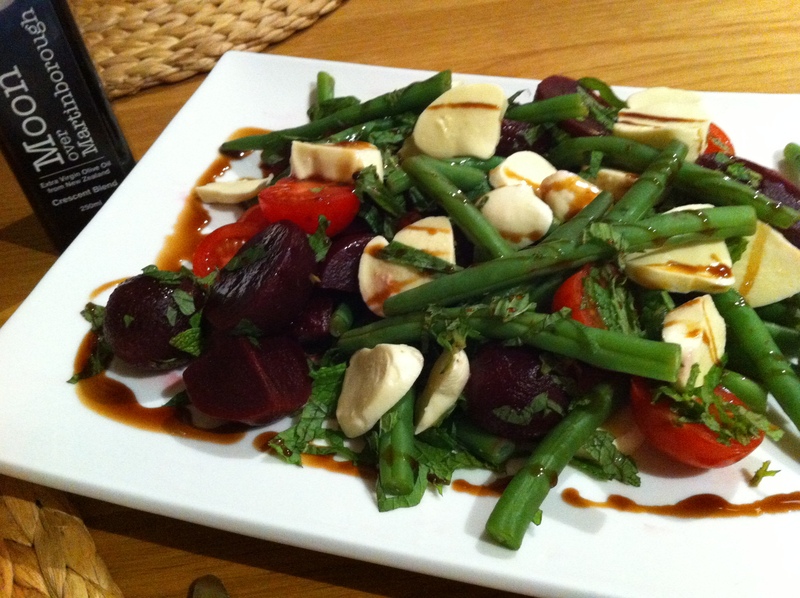 The blanched beans and beetroot gave a fresh crunch, and the milky bocconcini drank up the syrup. Once again the special olive oil was on the table. Thanks to Jared from Moon over Martinborough for sponsoring the food Blogger’s conference. Your oil just keeps on giving. We got home and I made him make us some! Deeeelish! If you get bored of it on salad and use it for sweet onion jam.